Some days I wonder if we were set up from the get-go to expect less, to hope for less, to dream of less. Bobby's prognosis was grim and bitter to the heart when he was a tender five. And yet here he is at 21 continually amazing us with the strides he makes. The public perception of autism continues to be one of grim stereotypes. Certainly there is a sizable minority edging to the halfway mark of moderately to severely disabled autistic individuals; this appears to be what the general public pictures when they hear the word autism. Just as certain is that my three children aren't there; they aren't severely disabled, not now, but once upon a time, my son was much more severely impacted so that many standardized tests placed him in the first percentile. To say that there is a huge array of disability in the first percentile is to put it mildly. 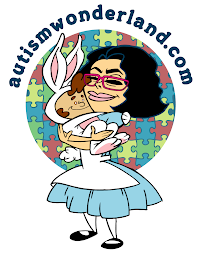 There's a world of difference between where my son once was and where the most severely autistic are. I think this reality that the spectrum is vast and wide is one of the most important public awareness messages we can get out there. We don't want to ignore the realities of the most severely disabled, but we want to make sure that people get an accurate sense of what autism can look like. The reality is that autism is, for most of us, a product of availability heuristic: the particular expression of autism you see most often (your child or yourself, or the other people in your life with autism) is what autism is to you. Autism is a pervasive developmental delay, not the end of development, and children who were significantly delayed, dramatically impacted by their autism, can come huge distances, so much so that around 20% will lose their diagnosis. While my three aren't all of a sudden non-autistic, it's important to acknowledge that they've come so far and the delays aren't always obvious to the casual observer (especially the girls who are academically shining). My three work so hard to develop skill sets that don't naturally arise (at the regularly scheduled time) that there are days where my hope for them far outstrips my worry. I dare to dream of possibilities we were told would be impossible for my son. I believe more each day that where functional life skills are concerned that his abilities are continuing to come along, to catch up, so that living at least semi-independently can be a real goal, that with training, a paying job may indeed be a part of his future. The real world, outside of school, allows for that chance to develop and grow, to build on successes. In an academic setting where his intellectual disability is most obvious, the frustration of not-able-to fed on each failure to master a skill, each year where skill sets remained seriously delayed and at the first percentile. In the real world, though, of household chores and physical labor, successes build on each other and give my son the sense of mastery and accomplishment. He's willing to try, and his comfort zone expands and grows so that he is able to not only do more but to engage in more conversation with new people, to respond to and directly engage people he's only recently met. Competence begets competence. He volunteered Friday and Saturday with the walk, and Saturday afternoon, he surprised us by being up to the new challenge of driving the riding mower home from a neighbor's house. Rick followed closely behind, but the boy man took an important step and navigated a complicated task successfully. Thankfully his hands WERE on the wheel while driving. My point is, in sharing this new leap in a series of leaps, that when we are primed to believe that disability is inevitable and constant, that the best we can "hope for" is the last thing we'd wish for our children, it can be tremendously easy to fall into a habit of expecting no more than we've been told they can ever aspire towards and working towards even less. We have much work to do, not just with the public, but with ourselves, as well: to believe that progress and new skills are acquirable if we keep pushing for it, working on it. No, not all of our children with autism and other issues will leave disability behind, but they can all make progress, grow and develop. We must remember that when we build on a series of small successes, the feeling of competence will make additional progress all the more possible, because they will believe it to be possible. We've got to stop those professionals who may mean well but who frame our child as a series of disabilities and never-gonnas. We must, instead, focus on where they are now in terms of skills and abilities and build incrementally on those successes. We've got to stop ourselves, as parents and relatives, from focusing on the disability, too. It won't be easy, especially when the reality is daunting, that the disability is severe, but having faith that we all have the capacity for growth and development is key to taking the steps to set up an environment where that growth is possible. Explaining how to back it up (after he'd driven it home).